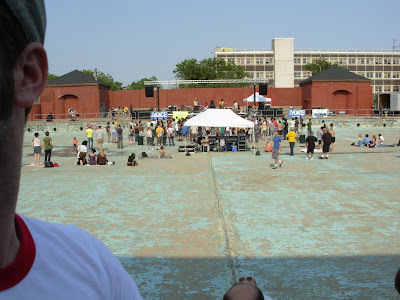 Is This Goodbye McCarren Pool? Let's hope that some compromise allowing for a pool and some sort of performance structure is arrived at in the coming months. If not Sonic Savvy New Yorkers will forever look back at two summers where the best place to spend your Sunday was an empty pool filled with the sounds of the buzziest bands of the time. In celebration of possibly the last Pool Party I've listed the ten best shows I've seen at their. This weekend marked one of the most anticipated Seaport free shows of the summer and the last free McCarren Pool Show. It was a diverse and mostly positive, if entirely too damp, weekend of live music. I will reserve my judgement of Takka Takka and The Forms, who both played heavily abbreviated sets in the rain on Friday. (but seriously I'm certain both of these bands are terrible.) Here's my ratings. The National (Seaport) 89% - This band is going to be around for a while. They have sturdy songs and an impeccably towering sound without an inch of fat. Basically you will almost never see a National fan embarrassed for their band of choice, that's a lot to say in this day of genre hopping and retro kitsch. 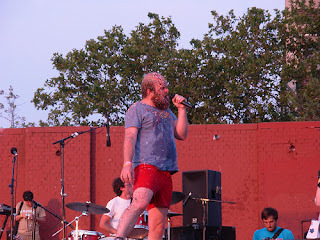 The Cool Kids (McCarren Pool) 81% - Four songs is a terrible way to judge a live performance. The Cool Kids did everything they could with their time, I hope to see them again soon. 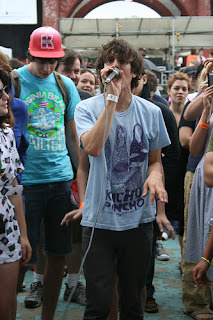 Spank Rock (McCarren Pool) 84% - Flossing, simply flossing. The rest of The Baltimore Bass Connection (McCarren Pool) 82% - The whole Baltimore Bass performance was pretty impressive, But really I almost would have preferred single sets from all the performers. Not just Spank Rock and The Cool Kids, but Kid Sister and Betty Black Pase Rock. 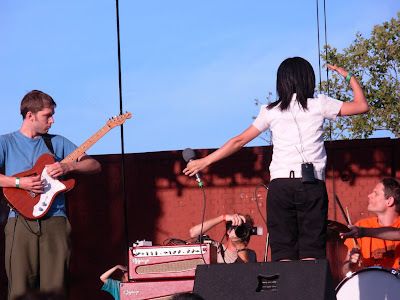 Ghostland Observatory (McCarren Pool) 27% - It's sad that the last free pool party would end with this band. Initial good will was wide spread for this band but about three songs in (after the vocoder lost it's novelty) I realized that they sounded quite a bit like INXS. How am I supposed to hang with that? I've seen two trailers this weekend that play up the less is more vibe. As of now I will likely see both of them but they do show that there is a right way and a wrong way to do these kinds of trailers.